PerfectDisk, the world's most popular and thorough disk defragmentation solution, combines speed, thoroughness flexibility, control and ease-of-use to help improve PC and server perforance. Global enterprises benefit from faster computers through regular, automated, unattended defragmentation with PerfectDisk. Certified by Microsoft for Windows, PerfectDisk is designed for today's largest disk drives. With the PerfectDisks Command Center management console, complete management and control is at the administrator's fingertips. If you really need disk defragmentation, optimization, as well as free space consolidation, then PerfectDisk will surely meet each of your high demands and precise necessities. Maximize your use of Windows 7 with the world’s first and only disk defragmenter certified by Microsoft for Windows 7. The new requirement for managing SSDs is a disk optimizer that identifies which drive is which - SSD or HDD - and then performs the appropriate actions for each drive. With SSD storage, you want to decrease the number of writes/updates to the SSD, so any sort of optimization pass performed on the SSD should do as little shuffling of files and data as possible. What can provide a performance benefit to SSDs is free space consolidation. High free space fragmentation is a strong indicator that many partially full "untrimmed" blocks exist. PerfectDisk's SSD Optimize eliminates free space fragmentation on the SSD and consolidates partially full blocks of data. Raxco Software draws upon its pioneering work with free space consolidation to provide the new SSD Optimize method in PerfectDisk that focuses exclusively on what matters in SSD performance. PerfectDisk performs intelligent analysis automatically and utilizes sophisticated free space placement algorithms to enable peak SSD performance: Consolidates free space on the drive without also performing a traditional defrag. Identifies where the largest section of free space is located and consolidates free space in that location - regardless of whether it is at the beginning, middle, or end of the disk. By working with the beneficial properties of solid state drive technology, PerfectDisk's SSD Optimize is able to maintain SSD performance over the long term without causing additional wear on the disk. _ Every Microsoft Windows operating system has a registry that holds a wealth of information about your computer, which is why we constantly hear from users that after using their PC for a short length of time, it no longer works the way it used to. This is due in part to invalid entries that exist in your system registry, that might exist because of software you are no longer using or software that was not properly removed. By removing these invalid entries, you can significantly increase the performance of your PC The most common PC troubles are found at locations spread throughout your PC. We have pinpointed these locations, and our scanner allows you to scan for invalid registry entries that might be causing your PC issues. The software will inform you of where the errors exist, and what potential errors they might cause. 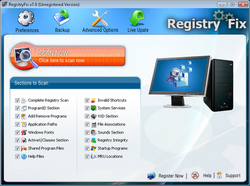 RegistryFix will scan for errors related to ActiveX controls, DLL issues, Windows explorer errors, Windows installer issues, Internet Explorer errors, Iexpore and System32 errors, Runtime errors, Outlook and Outlook Express Errors, EXE errors, Svchost errors and a wide variety of other system issues. There are a million Registry tools on the market but 727Customz recommends this product!!!! Do not use on Win7 systems******* They have a built in registry tool that handles the registry automatically!!!! 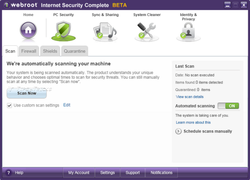 _Protects against viruses, spyware, worms, rootkits, trojans and other malware threats all in one application. Blazing fast performance and exceptional value whether you need protection for one or many PC's! Hard Disk sentinel is a multi-OS SSD and HDD monitoring and analysis software. Its goal is to find, test, diagnose and repair hard disk drive problems, report and display SSD and HDD health, performance degradations and failures. 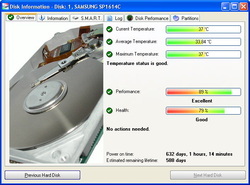 Hard Disk Sentinel gives complete textual description, tips and displays/reports the most comprehensive information about the hard disks and solid state disks inside the computer and in external enclosures (USB / e-SATA). Many different alerts and report options are available to ensure maximum safety of your valuable data. No need to use separate tools to verify internal hard disks, external hard disks, SSDs, disks in RAID arrays as these are all included in a single software. Hard Disk Sentinel monitors hard disk drive / HDD status including health, temperature and all S.M.A.R.T. (Self-Monitoring, Analysis and Reporting Technology) values for each disks. Also it measures the disk transfer speed in real time which can be used as a benchmark or to detect possible hard disk failures, performance degradations. Mac Blu-ray Player - Mac Blu-ray Player is the world's first and best Blu-ray Player supporting Mac and PC systems.